I heard of Brandon Sanderson before he was picked to complete A Memory of Light; tentatively first through his standalone epic fantasy Elantris, and then through his Mistborn trilogy. Warbreaker is his other standalone fantasy novel, that has a comforting similarity in structure and plot to his trilogy and standalone epic. It is an absorbing tale of magic, political intrigue and godliness, that manages to be both unique and familiar at the same time. Brandon Sanderson loves magic. Elantris used writing and Mistborn used metal. Warbreaker's magic system is built around Breath and color. Using rather modern nomenclature like BioChroma and "commands", the magic system is rather elaborate, nascent and pervasive. There is a lot that is not known about the magic, and this allows for a wide variety in the levels of power and skill among the various characters. The pervasiveness, another Sanderson hallmark, builds the entire society, economy and theology around the magic, keeping it front and center through out the book. Yet not much is actually performed. This helps keep the story less about tricks and more about the people wielding it. The plot for the story is plain. After a devastating war in the region, centuries ago, there arose a number of kingdoms, the largest called Hallandren, which wholeheartedly embraced and built a society where purveyors of the magical Breath were celebrated and worshiped. The original kings of the land were banished to the highlands, to create a much smaller and hardy kingdom called Idris, built on the rejection of all things magical. The feeling of mutual distrust and hatred come to a head when according to an agreement the daughter of the original royal family is to be married off to the God king of Hallandren. Incompatible theology does not go well with a society that is already alienated; something has to give way. The characters in the book follow Sanderson's familiar yet different model. We have Siri, who is the rebellious youngest daughter of the king Dedelin of Idris, who is vexing under authority, but learns to curb her disobedient streak in the face of true responsibility. Her sister, Vivenna, is quite the opposite. She is a model princess during her upbringing, but in the face of adversity realizes that her bookish knowledge does not matter that much. The third character that carries the narrative is the most inventive and interesting of the three. Lightsong the Bold, is a God - a living breathing god, brought back to life thanks to the random gift of magic. Lightsong, is playful, irreverent and blasphemous in not really believing in his own devinity, much to the frustration of his priests and followers. The narrative primarily revolves between these three characters. The story has a comfortable pace, slowly building towards what is expected to be a deadly climax. Several plot elements unfold rather predictably. The twists in the tale are fun, but rarely make you to want to re-read the sentence because that simply could not have happened. Character are not always as ruthless as they could be. The entire story arc of the King Dedelin and Idris seems rather open and unresolved. Maybe the epilogue could have been put to different use? All said, if you are a fan of fantasy or Sanderson, this is a must read. The tone of the story is not very dark. So it also makes a good introductory volume for someone not currently a fan of the fantasy genre. 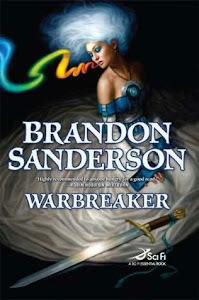 Warbreaker is part of a unique experiment by Brandon Sanderson. Following on the footsteps of Cory Doctorow, the book was released both as a published hardcover and as a free-for-download eBook version.